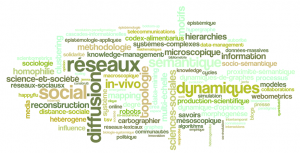 (Dynamiques sociales et sémantiques dans les communautés de savoirs: morphogenèse et diffusion.) [Thesis (in french), pdf], [defense slides (in french)]et [résumé] – obtained the “Prix de thèse” 2010 of École polytechnique. Knowledge communities involve actors who interact within a social network and who produce, share and exchange information. Our study relies primarily on two empirical case studies: scientific communities and communities of bloggers, or more specifically political bloggers. In both cases, these systems are appraised in both their “social dimension” – set of actors interacting with each other (through a collaboration network or a citation network), and in their “semantic dimension” – set of content distributed other various sources (scientific publications or blog posts). We aim at illustrating the co-evolution between these two dimensions, namely the correlated dynamics between social network and information distribution over system actors. 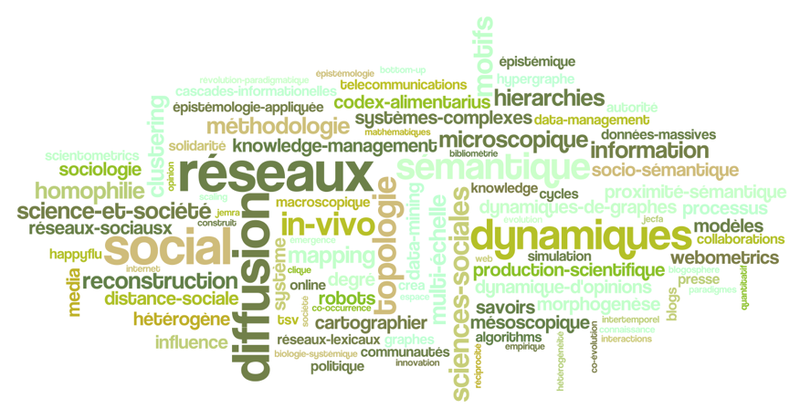 The objective is then to develop methods for quantitative analysis of the dynamics of these knowledge communities including the processes they support by adopting a dual perspective: social and semantic. The questions raised by these socio-semantic systems can broadly be divided into two categories: (i) network morphogenesis: detection of non-trivial global patterns along with the study of local behaviors likely to reconstruct macroscopic organization of the networks (ii) diffusion in social networks: study of local or global properties of social networks that may modify the dynamics of information diffusion within these communities.